Keith Herron, the owner and principal designer at Herron Audio, is a graduate of Iowa State University and a Registered Professional Electrical Engineer. He was formerly director of R&D for Ampeg, Crate, and Audio Centron. 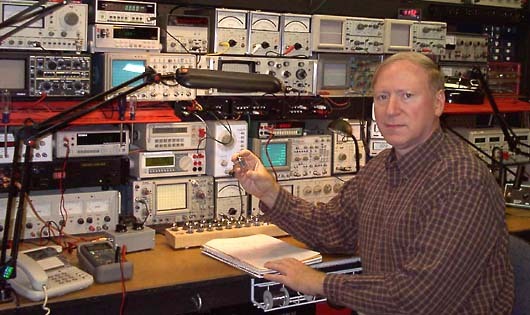 He combines a strong background in electronics, mathematics, physics, and music with a keen ear and an open-minded analysis of audio equipment design. He describes himself as an audiophile, a lover of music, and a "former" musician. I have spent many years learning (and in some cases unlearning) the many facets of audio design. It would seem that there is much more incorrect than correct information available in audio. I refer to the method I use as "Audio Pathology" which entails studying that which sounds good and that which does not and then searching for the real reasons why. With time, certain undeniable principles hold true. The search has often involved rigorous application of physics and mathematics and investigation of the smallest details in circuit analysis of the electronics of sound. It has involved a new definition of what is natural as we would perceive live acoustic un-amplified sound. As audiophiles we tend to focus on frequencies - highs, lows, and mids. If we focus on the time domain rather than the frequency domain we find that from Fourier analysis reproduced audio events in a timing sense can only be correct when the frequency response and phase response are correct. This includes distortion and added resonances in the audio components, interconnecting cables, and transducers. It means listening on a full frequency system, yet not listening for highs or lows, but rather listening for events focused in time. If the beginnings and endings of all events are clear and easy to decipher, then the highs and lows must be correct. It is hearing the events as they would naturally happen, such as the sound of the hammer hitting the strings in a piano. The sound should be clear and the events should happen in the correct order as opposed to hearing the strings vibrating before some confused presentation of the hammer striking them later. When you have heard it done right, you will know immediately. Correct presentation in time is the key element to transparency. We experience this every day in our listening to the un-amplified world around us. It gives us the ability to decipher what the source of the sound is and precisely where it is located relative to our listening position. Transparency is so much more than just low distortion. It is that rare and special ability of an exceptional piece of audio equipment to get out of the way of the performance and allow the listener to really hear the expression, emotion, and subtlety of each individual performer amidst the complexity and crescendo of the orchestra and chorus. The touch and feel of each instrument becomes profoundly clear - the foundation and the soul of the performance. There should be no equipment bias as to the type of music be it contemporary, jazz, rock, classical, and other forms of musical expression. All qualities of the music should be correctly presented to the listener as performed and recorded.